D = fdesign.highpass constructs a highpass filter specification object D, applying default values for the specification, 'Fst,Fp,Ast,Ap'. D = fdesign.highpass(SPEC) constructs object D and sets the Specification property to SPEC. Entries in the SPEC represent various filter response features, such as the filter order, that govern the filter design. Valid entries for SPEC are shown below. These entries are not case sensitive. Regions between specification values like Fst and Fp are transition regions where the filter response is not explicitly defined. The filter design methods that apply to a highpass filter specification object change depending on the Specification. Use designmethods to determine which design method applies to an object and its specification. Use designopts to determine which design options are valid for a given design method. For detailed information on design options for a given design method, METHOD, enter help(D,METHOD) at the MATLAB® command line. D = fdesign.highpass(SPEC,specvalue1,specvalue2,...) constructs an object d and sets its specification values at construction time. D = fdesign.highpass(...,Fs) provides the sampling frequency for the filter specification object. Fs is in Hz and must be specified as a scalar trailing the other numerical values provided. If you specify a sampling frequency, all other frequency specifications are in Hz. Highpass filter a discrete-time signal consisting of two sine waves. Create a highpass filter specification object. Specify the passband frequency to be 0.25π rad/sample and the stopband frequency to be 0.15π rad/sample. Specify 1 dB of allowable passband ripple and a stopband attenuation of 60 dB. Query the valid design methods for your filter specification object. Create a signal consisting of the sum of two discrete-time sinusoids with frequencies of π/8 and π/4 rad/sample and amplitudes of 1 and 0.25 respectively. Filter the discrete-time signal with the FIR equiripple filter object. Create a filter of order 10 with a 6-dB frequency of 9.6 kHz and a sample rate of 48 kHz. Look at the available design methods. The only available method is the FIR window method. Design the filter and display its magnitude response. You can specify the shape of the stopband and the rate at which the stopband decays. 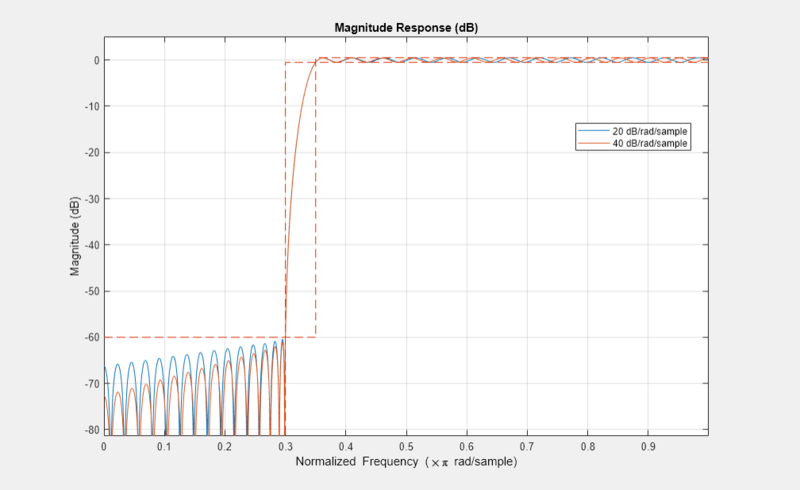 Create two FIR equiripple filters with different linear stopband slopes. 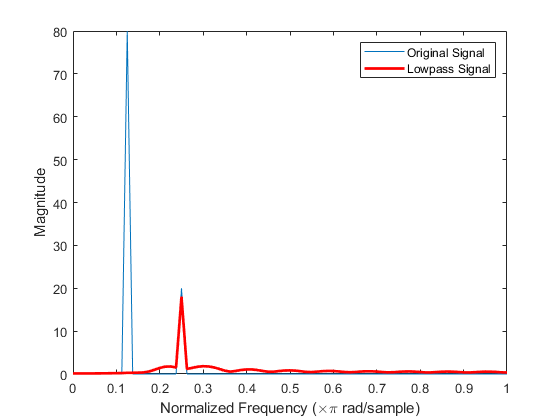 Specify the passband frequency to be 0.3π rad/sample and the stopband frequency to be 0.35π rad/sample. Specify 1 dB of allowable passband ripple and a stopband attenuation of 60 dB. 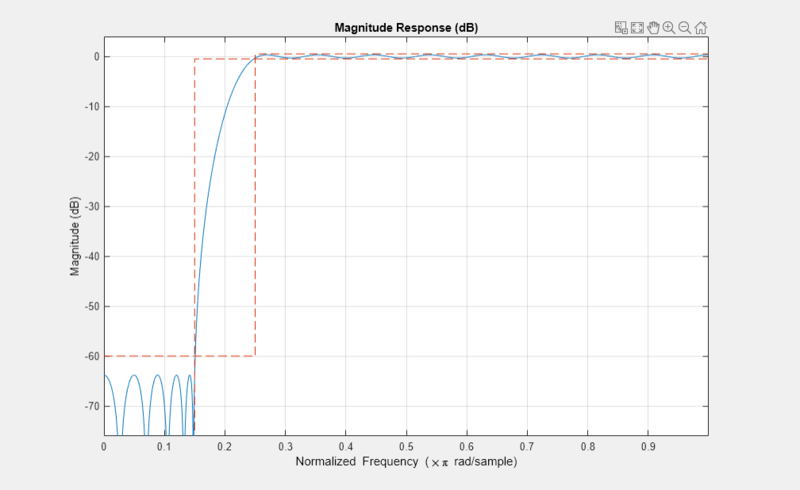 Design one filter with a 20 dB/(rad/sample) stopband slope and another filter with a slope of 40 dB/(rad/sample). 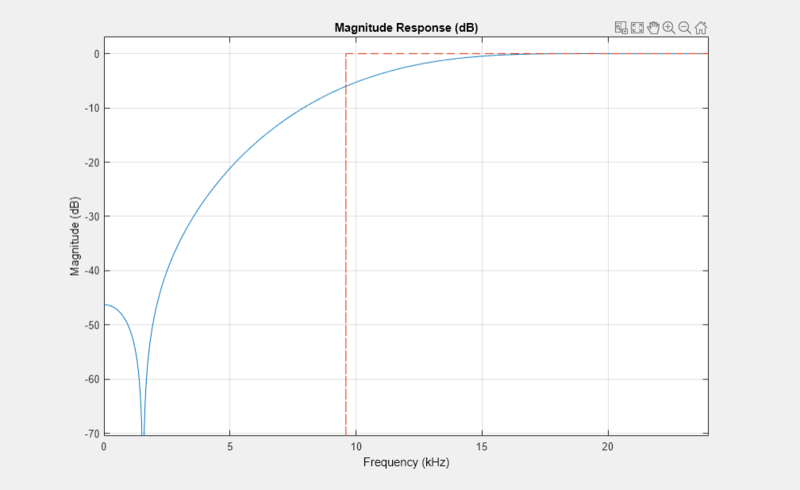 Visualize the magnitude responses of the filters.